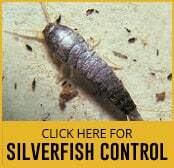 Why Do Silverfish Need to be Controlled? Although they may not seem dangerous or particularly bothersome, Silverfish are insects that can cause noticeable damage to home possessions. They are a form of shiny silver, wingless insect with three lengthy bristletails. They are slender and their bodies are about 1 cm long. The reason that silverfish control may not be a priority for some people is because these insects hide away during the day and only come out to feed during the night. They run and move quickly and therefore cannot often be spotted in dark conditions. They are most often seen in watery basins and baths after getting stuck, unable to escape. Throughout the day, they also hide in moist areas, such as bathrooms, sinks, close to piping and in the kitchen. Pest control for these insects is necessary because they are rummagers that can cause damage to wallpapers, books and other high-protein materials by eating away at them. They are also known, although rarely, to corrode wooden furniture. Their effect on these types of materials is quickly noticeable as an irregular missing patch. It is also simple to tell if you require silverfish control if you see scales, excrement, or stains that are yellow in nature on fabric or paper materials. The issue of pest control for these silverfish is a large one because the female will spawn about 100 eggs during her life and will lay them in warm and moist conditions, and these mainly include cracks and holes throughout the home. Her lifespan can range between a mere 3 months to a long 3 years depending on conditions. Her eggs will break open within eight weeks and they will be about 0.2 cm in length. The danger not only lies in the exponential growth of this insect when in the home, there is also the risk of transporting the pest, or their eggs, into the home through simple items like boxes, papers, books and other materials containing carbohydrates. Even though it may seem difficult to combat such a tiny and abundant form of insect, there are ways to influence the population. As well as ensuring that you have a relatively clean environment at home without food bits lying around, there are other treatments. Our goal is to provide you with the right services for your household and to provide the professional pest control that you may need.